Iran nuclear deal: Today's announcement was more substantive than expected. European Union foreign policy chief Federica Mogherini and Iranian Foreign Minister Mohammad Javad Zarif attend the announcement of an agreement on Iran nuclear talks in Lausanne, Switzerland, on April 2, 2015. 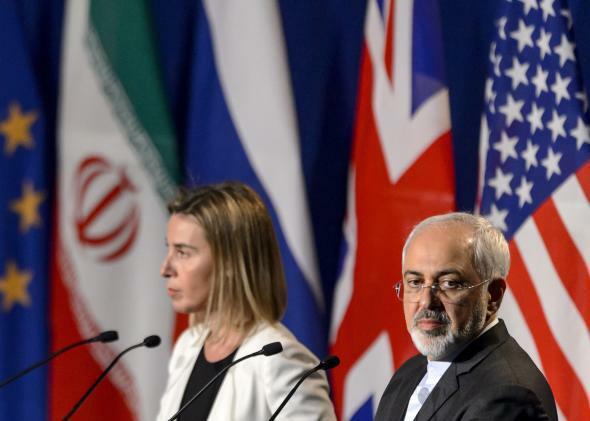 Whatever you want to call it, the “plan of action” read aloud today by EU foreign policy chief Federica Mogherini and Iranian Foreign Minister Javad Zarif was a lot more comprehensive than expected after eight days of fraught talks. As recently as Wednesday, the negotiations in Lausanne, Switzerland, appeared to be on the verge of collapse, with foreign ministers fleeing the scene. After marathon final negotiating sessions Wednesday night and Thursday, the general assumption was that the “agreement” would amount to only a vaguely face-saving “official press situation,” as Zarif put it earlier Thursday, that would kick the can down the road until the next round of talks this summer. But the deal announced Thursday afternoon actually contains some specifics. According to a fact sheet released by the State Department, Iran will reduce its installed centrifuges by two-thirds, to about 6,000, and won’t enrich uranium over 3.67 percent for the next 15 years. (“Weapons grade” uranium is more than 90 percent enriched.) Iran will enrich uranium only at its facility at Natanz, with its heavily fortified Fordow reactor converted to a nuclear research center. Inspectors from the International Atomic Energy Agency will have access to all of Iran’s nuclear facilities. And Iran will substantially reduce its stockpile of enriched uranium, though it’s not quite clear if it will be diluted or shipped abroad. There’s still a lot to be hammered out, including the extent to which Iran will have to answer the IAEA’s questions about its past nuclear activities. The oversight and inspection mechanisms still have to be designed. And, comparing the Iranian and American statements Thursday, there still also appears to be ambiguity over whether sanctions will be lifted immediately upon signing of the final deal or gradually as it goes into effect. We shouldn’t assume that the description of the deal in the U.S. fact sheet is binding. Previously in these talks, details that seemed to be agreed upon have later turned out to have been “tentative.” Even before the announcement, the Iranian team was leaking to the country’s media that none of the country’s nuclear activities would be suspended, a spin quite different from what we’ve heard from the American side. There is also the not insignificant fact that both sides are negotiating not just with each other but also within their own governments. The time between now and June, when the final details will be negotiated, provides plenty of opportunites for opponents in both Tehran and Washington to interfere. Still, Thursday’s statement is far more substantive than expected. It also vindicates Kerry and Obama’s decision to blow through the March 31 deadline earlier this week and keep the Iranians at the table. As the Guardian noted Wednesday, the last time U.S. diplomats spent this long negotiating on foreign soil was at the Versailles peace conference in 1919. As the administration heads for an inevitable showdown with Congress over sanctions, that’s probably not a historical comparison it wants to think about.